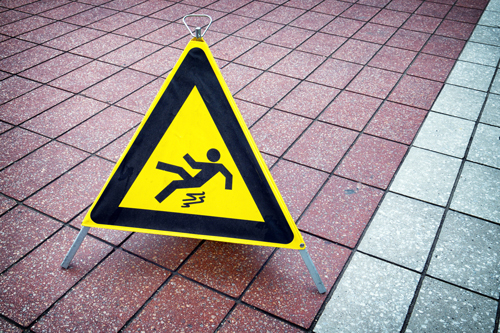 Common Places for Slip and Fall Accidents | Paysinger Law, P.C. Over one million emergency room visits occur each year due to a slip and fall accident. In addition, according to the National Floor Safety Institute, slip and falls are also the primary reason employees miss work due to injury. But employees and workers aren’t the only ones who are vulnerable to slip and fall accidents. The elderly are also at an increased risk for sustaining significant injury after a slip and fall accident. These accidents can cause excessive medical expenses, rehabilitation fees, and lost wages due to time off of work. In the elderly, a slip and fall accident can even result in death. As with any accident, the first thing you should do is to seek medical attention immediately after a slip and fall accident. If you are injured in the workplace, report your injury to your supervisor immediately. If you are injured in a store, it is imperative that you report your accident and your injury to the manager of the store or the store owner. Failure to report your accident could result in an inability to file a claim and collect the compensation you need. Once you’ve reported your accident and you’ve sought medical treatment, it is important to contact an experienced attorney immediately. Slip and fall accidents are difficult to prove and your attorney will need to gather evidence quickly to ensure that you receive the compensation you deserve. While your attorney is gathering evidence and building your case, you can help your claim by regularly attending all medical appointments and by following your doctor’s order precisely. Failure to follow your doctor’s prescribed treatment plan could adversely affect your case. If you’ve been injured in a slip and fall accident in Denver, it is important to understand the complications you may face when trying to collect the compensation you deserve. At Paysinger Law, P.C. our attorneys have the experience and resources needed to tackle these complex cases. We have long been assisting injured accident victims in Denver, and our commitment to our clients sets us apart from the rest. Call Denver attorney Robert Paysinger today to discuss your case. Our law firm offers FREE case consultations and can be reached at 303.279.0221.